For the past six years, Amber created beautiful balloon art at Senator Vogel's Kid's Extravaganza. 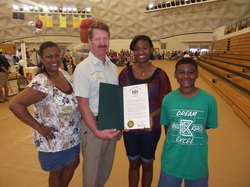 The Senator presented Amber with numerous Citations for her many achievements. Join Amber and Senator Vogel annually at CCBC for ongoing fun and excitement! Amber enjoyed making balloons for the past several years for Representative Jim Christiana's Kidz Day celebration. 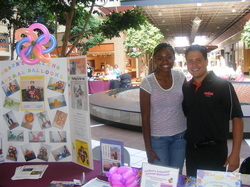 She also participated at Representative Jim Marshall's Children's Expo, sharing balloons art. Be on the lookout for Amber at an event near you! Or invite her to add flare and excitement to any event! *Children’s clothing *Household items *Beds *Foods *Walmart gift cards * Monetary donations. The first year, donations helped over 100 families. The following year was even more successful. Amber will continue her fundraising efforts to help the community. Other organizations Amber supports include: *The Women's Shelter of Beaver County *Mental Health Association of Beaver County* Beaver Valley Church of God *National Association of the Church of God *Beaver & Bridgewater community events, and more! Amber with Beaver County Commissioner Joe Spanik, fellow Pro-to-Pro member and Lifesteps employee/fundraiser organizer Tracy Alexander, and brother Robbie Liggett at Lifesteps fundraiser. Here's Amber twistin' up fun at Cosco for the Children's Miracle Network.